How to enable dictionary search in Google? Ho do I enable Google dictionary search in Google web results? If I do a google web search (e.g. 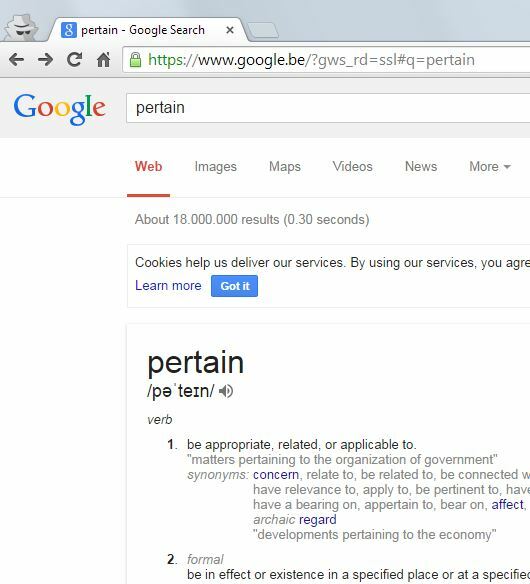 for the word 'pertain') in my private gmail account, I don't get any Google Dictionary definitions. If I do the same search when logged in with my work gmail account (through google apps), I do get dictionary definitions. Why is that so? I didn't find any settings to enable/disable this. This seems to be an issue with your language settings. 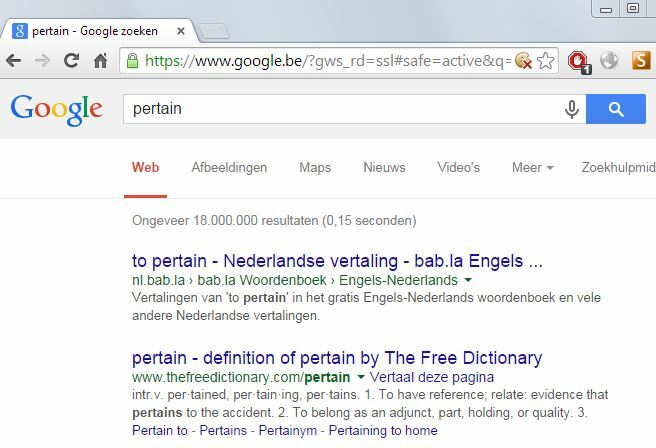 Notice how the Google interface is in Flemish (Afbeeldingen, Nieuws, ...) using your private account, but in English (Images, News, ...) using the work account. I can reproduce this behaviour. Click the Languages tab, select English and Save. Googling for English terms (like pertain) should now produce dictionary/definition results. How does Google keep web history? On Google search, is there a way to disable autocomplete but keep Instant? Is there a workaround where I can enable Google Safe Search but disable YouTube Safety Mode? Is there a way to get Google Search to give you definitions for words in languages other than English? No results on Google Search in normal mode, but results in incognito? Can I exclude Google Books result from Google Search?